Fashions changed over the centuries, but rather slowly. Most Romans wore tunics, the Chinese wore robes of various length. 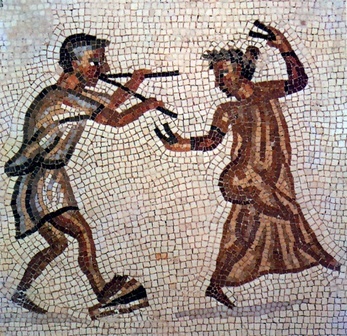 The peculiar formal Roman dress for men was the toga, a roughly semicircular woolen cloth that could be as long as 5.5 meters (18 feet). Draped around the body in a complicated way, leaving the right arm bare and limiting the movements of the left, it was not the dress for physical activity or laborious work. Cato’s statue below shows him wearing the toga over a tunic. The image alleged to be Confucius, drawn twelve hundred years after his time, need not depict anything authentic. 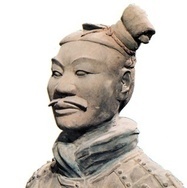 However, many warring-states and Han Dynasty texts refer to Confucians wearing long and cumbersome garments, which distinguished the literati from the “little men” who labored for a living. 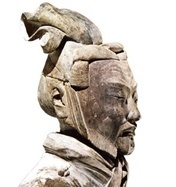 They incited resentment from people like Liu Bang, the commoner who became the founding emperor of the Han Dynasty. Woman being the submissive gender in both societies, upper-class garments seemed designed to restrain activity. Statue of Cato the Censor, the Republican senator who advocated “Carthage must be destroyed”. (Lateran Museum, Rome). Marble statuette of a late-fourth century empress. (Bibliothèque Nationale, Paris). Alleged image of Confucius (551-479 BCE), rubbing from an engraving that copied a painting by Wu Daozi, active 720-60. 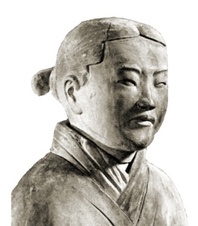 Painted wood statuette of a woman excavated from a tomb in Mawangdui, Changsha, interred soon after 168 BCE. Chinese silk reached the Mediterranean around the time of Julius Caesar. It enabled women “to flaunt transparent raiment in public,” as the elder Pliny complained. A second-century BCE semi-transparent silk robe only 49 grams in weight. The background is the detail of an embroidered silk fabric. Both from Mawangdui in south China. Boots also went well with toga. 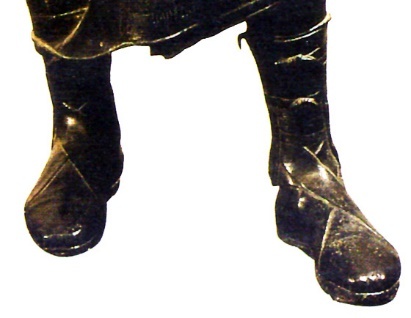 Legionary sandals with hobnails studded soles. The reinforced sole of a soldier’s shoe. A Latter Han Dynasty brocade shoe. 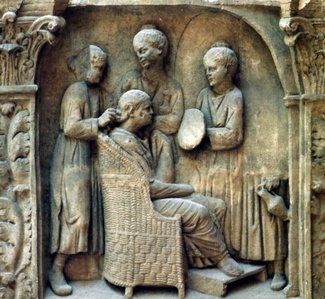 Roman men cut their hair short and were traditionally clean shaven. 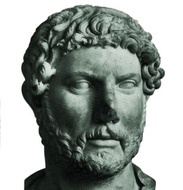 Hadrian was the first emperor to spot a beard. The Chinese let their hair grow; filial piety demanded no damage to this gift from parents. Men tied their hair up in top knots of all manners. Upper class men wore caps that also demonstrated their status. 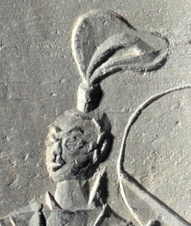 A general wearing a cap. Terracotta figures excavated near the mausoleum of the First Emperor. 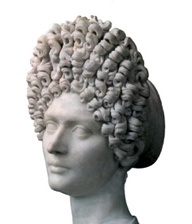 Women of the leisure class spent much time in toiletry and changed their hairstyles dramatically. 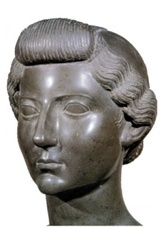 Portrait of Livia, Augustus’s empress. (Louve, Paris). Terracotta figure, probably a maid associated with the First Emperor’s tomb. 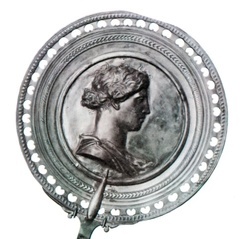 A southern lady of the fourth century. Tomb relief,Dengxian, Henan. A woman having her hair dressed, with a slave holding a mirror. Relief from Trier in Gaul, fourth century. (Araldo de Luca, Corbis). Section of a scroll by Gu Kaizhi (c. 344-406). The woman on the right holds a mirror while applying cosmetic. The one on the left has her hair dressed in front of a mirror stand. (British Museum, London). 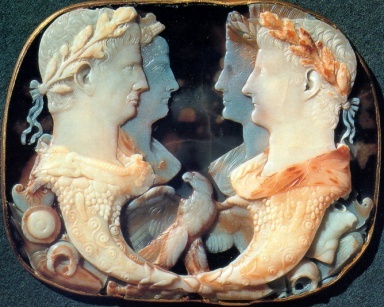 Mirrors became valued accessory, often with highly decorated backs.